You can't compare the Birch Aquarium to the Aquarium of the Pacific in Long Beach. This aquarium is much smaller but packs a punch when it comes to education and sea life. There are some very cool exhibits here and this is a beautiful destination for anyone who wants to learn about fish, the ocean and our environment. One of the interesting exhibits is called, "There's Something About Seahorses". 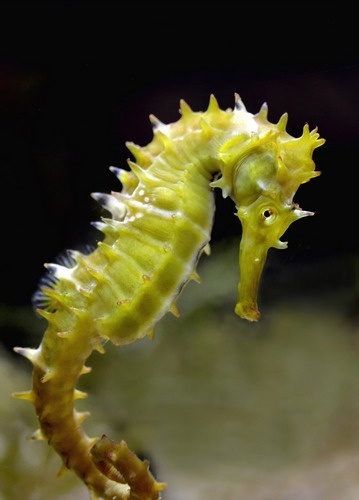 This features more than a dozen seahorse species including seadragons and pipefish. Through interactive displays, you can find out what makes a seahorse a fish, learn how seahorse males get pregnant and give birth, and visit babies in a special seahorse nursery. Also featured here are three man-made tide pools out in the back where you can touch the sea life! Its called, Preuss Tide-Pool Plaza and is the highlight for kids, and the view of the Pacific Ocean from up here is beautiful! The tide pools contain seastars, sea cucumbers and other unique animals local to San Diego's tide pools. For this being such a small place compared to other aquariums, there sure is a lot to see. It shouldn't take more than two hours here which is great for kids. Oh and it could be a great place for a first date! 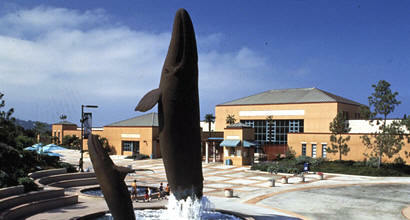 The Birch Aquarium is open daily from 9am to 5pm but it's closed on Thanksgiving, Christmas and New Years Days. They offer three hour courtesy parking, but keep in mind, they stop selling tickets at 4:30pm and the aquarium closes at 5pm. This aquarium qualifies as an attraction on the GoSanDiegoCard. It's a sightseeing pass that you can customize to the attractions you want to see and can save you money. Its worth checking out! Closest hotel to the aquarium is listed first. I have not personally stayed at any of these hotels so please click on each hotel to read the reviews before booking your trip.